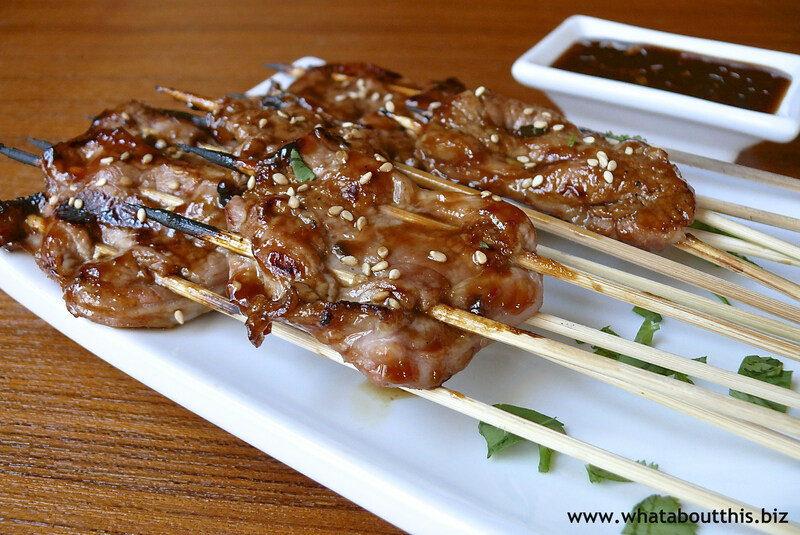 Grilled Pork Kebabs with Ginger Molasses Barbecue Sauce | What about this? “How do I love thee? Let me count the ways.” Elizabeth Barret Browning did not pen those words while reflecting on food, but for some reason, her words danced through my head as I ate the Grilled Pork Kebabs with Ginger Molasses Barbecue Sauce. Let me count the reasons why I love this recipe. Made from lean pork tenderloin, these kebabs are lower in fat. In fact, in an article written by Jeff Volek, Ph.D, R.D. for Men’s Health, he states, “Pork really is the other white meat. Ounce for ounce, pork tenderloin has less fat than a chicken breast.” In addition, as the complex flavors of the sauce swirled in my mouth, I thought about its versatility and how fabulous it would taste on other grilled meat, particularly salmon, prawns, or chicken. The final reason why I love this kebab recipe focuses on its ease of preparation and its make-ahead convenience. Serve these kebabs with rice pilaf for Valentine’s Day and experience love at first taste. 1. To make barbecue sauce: Stir together all sauce ingredients in a 1- to 1½-quart heavy saucepan and briskly simmer, uncovered, stirring occasionally, until thickened and reduced to about 1/2 cup, about 3 minutes. Transfer sauce to a medium bowl and cool to room temperature. 3. Thread 2 skewers, 1 at a time and 1/2 to 1 inch apart, lengthwise through each slice of pork and transfer to a tray lined with plastic wrap. 4. If using a charcoal grill, open vents on bottom of grill, then light charcoal. Charcoal fire is hot when you can hold your hand 5 inches above rack for 1 to 2 seconds. If using a gas grill, preheat burners on high, covered, 10 minutes. 6. Cooks’ notes: Barbecue sauce can be made 6 hours ahead and chilled, covered. Kebabs can be prepared 6 hours before grilling (without salt or sauce) and chilled, covered with plastic wrap. If you aren’t able to grill outdoors, cook kebabs in a hot oiled well-seasoned ridged grill pan over moderately high heat. 1. For even cooking, try to cut pork in uniformly thick slices. 2. The spiciness of the sauce can be adjusted by reducing or increasing the amount of minced chile. 3. *I make double the amount of sauce and pour about half of it into a separate bowl to serve alongside the meat or to slather it on the grilled meat prior to serving. Discard the remaining half that was brushed onto the raw meat. 4. These kebabs make hearty appetizers and taste just as good when served at room temperature. 5. I sprinkled toasted sesame seeds on the kebabs and cilantro leaves on the serving plate prior to serving.